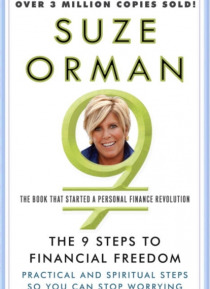 Suze Orman has transformed the concept of personal finance for millions by teaching us how to gain control of our money -- so that money does not control us. She goes beyond the nuts and bolts of managing money to explore the psychological, even spiritual power money has in our lives. The 9 Steps to Financial Freedom is the first personal finance book that gives you not only the knowledge of how t… o handle money, but also the will to break through all the barriers that hold you back.Combining real-life recommendations with the motivation to overcome financial anxieties, Suze Orman offers the keys to providing for yourself and your family, including:* seeing how your past holds the key to your financial future* facing your fears and creating new truths* trusting yourself more than you trust others* being open to receiving all that you are meant to have* understanding the lessons of the money cycleThe 9 Steps to Financial Freedom is useful advice and inspiration from the leading voice in personal finance. As Orman shows, managing money is far more than a matter of balancing your checkbook or picking the right investments. It's about redefining financial freedom -- and realizing that you are worth far more than your money.